As a member of the Sheldon Art Association, you are invited to participate in a unique travel experience to Mexico City with Wally Mason, Sheldon's director and chief curator. 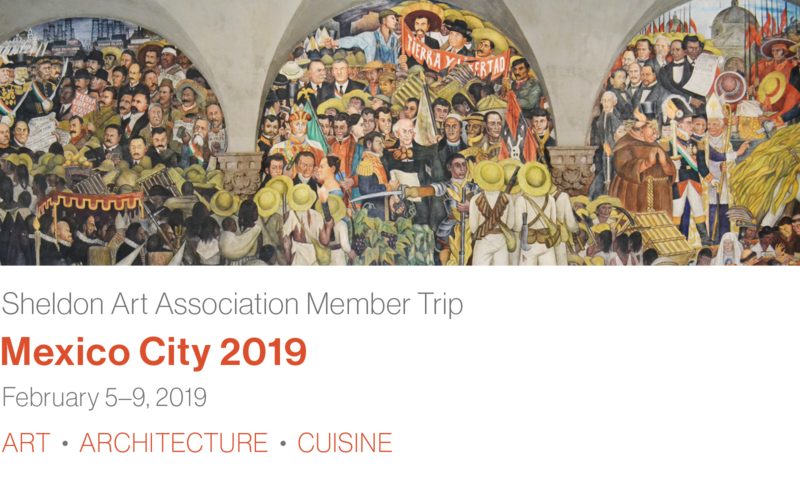 You will experience the art, architecture, and culinary delights of Mexico in addition to VIP preview access to Zona Maco, Mexico’s art fair showcasing Latin American and international art. Visit the Frida Kahlo Museum, meet some of Mexico’s most prominent contemporary artists, and enjoy exclusive private access to the homes of art collectors. Discover the architecture of Luis Barragan, Mexico’s most important modernist architect and Pritzker prize winner. Dine at Mexico City’s top restaurants such as Rosetta, Tetetlan, Amaya, and more. If that isn’t enough, for an additional fee, you may extend your visit through February 10 and participate in a special tour of Teotihuacan and the National Museum of Anthropology. Mexico Cultural Travel will be working directly with Sheldon to organize and oversee all aspects of this trip. The cost per person is $3,990 single occupancy and $3,250 double occupancy. Air transportation is not included. Teotihuacan and the National Museum of Anthropology, Saturday, February 9 to Sunday, February 10. The cost per person is $600 single occupancy and $415 double occupancy. Questions? Monica Babcock at 402-472-2463 or mbabcock1@unl.edu. Download a copy of the registration form here.